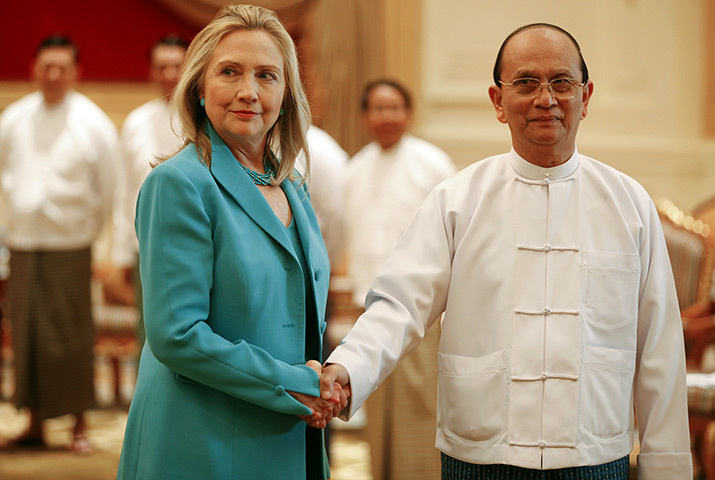 When Secretary Clinton left Burma on December 2nd, she left the ball in President Thein Sein’s court. The trip was a gift in and of itself, and Clinton made it clear that if Burma wants to continue to improve ties with the United States it has to take clear measures of reform such as the release of all political prisoners, an end to hostilities in ethnic areas, and lasting democratic reform. Only then will the US respond positively. In their meetings, President Thein Sein said he want to implement these reforms and Aung San Suu Kyi has even expressed belief in Thein Sein’s sincerity; however, the question remains how much power does Thein Sein actually have? Over the past few months we have seen the reach of the military in politics. Authorities had announced that political prisoners would be released before the ASEAN Summit in November; however, the release never came. What was revealed eventually, was that the National Defense and Security Council never approved it. It has been a common tactic for Burma to release prisoners before big international meetings or dignitary visits, and so it came as a great surprise that no prisoners were released before Secretary Clinton’s visit. Instead, the morning Secretary Clinton arrived civilian homes were burned down by government troops in Kachin state. It is clear that the ruling powers are a divided group. In a background briefing, a Senior State Department Official stated how there are three groups: those who support reform, those who are fence-sitters, and “There is a group that is opposed to reform and they – some of those individuals are – hold key positions inside the government.” Burma’s previously most well known “moderate” Khin Nyunt was sentenced and thrown in house arrest in 2005. A week ago, President Thein Sein ordered the military to stop fighting with the Kachin Independence Army in Northern Burma where there has been heavy fighting in the past six and half months. However, there have been ongoing reports of attacks against civilians with the Burma Army still bringing in reinforcements. Moreover, they have been removing soldiers who have become sympathetic with Kachin communities and replacing them with new soldiers. These are not actions that show the military is ready to stop any time soon. For activists in Burma’s cities it means they can’t trust the veneer of liberalization that Thein Sein wants the world to believe is underway. Thein Sein may place nice with Aung San Suu Kyi, but Burma’s authorities still aren’t that nice to others. Last week, a government aligned group of Buddhist elders ordered a prominent monk to leave his monastery because of political activities. Ashin Pyinyar Thiha is very well respected throughout the country and has given speeches at the National League for Democracy and let Aung San Suu Kyi hold events at the monastery. He also met with Secretary Clinton when she visiting Rangoon. For those working for the protection of ethnic peoples, the situation is far worse. In November, two community health workers in Karen areas were captured by the Burma Army and tortured. All Thein Sein’s talks of change can’t undo the reality that the military still maintains overarching power. Until that changes, civil society will still be in a dangerous situation.